Purchase 4 Pin CA RGB LED online in India at low price from DNA Technology. This is a 5 mm common anode RGB diffused LED. This LED basically consist of 1 red, 1 green & 1 blue LED in a single package. All these three LED's share a common anode and each of them have a separate anode through which you can control the intensity of individual color. As you know Red, Green and Blue are the primary color and using this three colors you can generate any color that you want. Similarly you can make this LED glow in any color as per your requirement by controlling the current of individual LED's or by using PWM technique. How does RGB LED work? 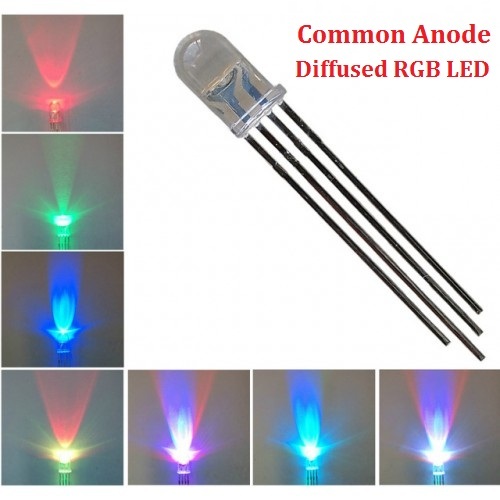 4 Pin Common Cathode RGB LEDDiffused Common Cathode RGB LEDThis is a 5 mm common cathode RGB diffuse..